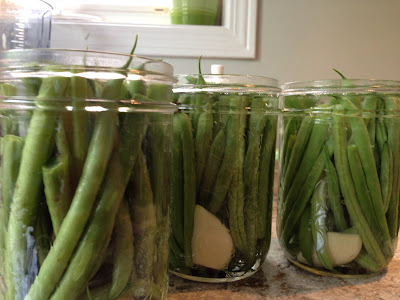 We made some pickled green beans a few weeks ago and are still waiting for them to be ready (4 weeks total). Using our simple brine we've pickled carrots, cucumbers, and various hot peppers. This is so convenient to do and since we can only find hot peppers in packs of 4 or more it's a great way to not waste produce. Prepare brine by adding 1 cup of water, 1 cup of white vinegar, and two tablespoons of salt to a small saucepan. Bring to a boil. Wash the peppers well. Slice into 1/4 inch slices and leave the seeds in them. Pack the jars tightly with your slices of Jalapeno Peppers. 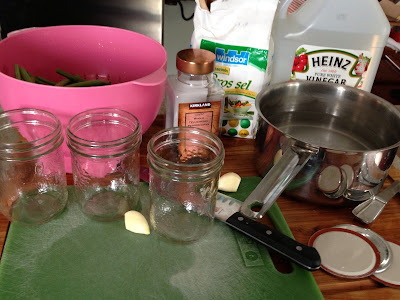 Add hot brine to the jars filling until there is a half inch of space left. Place lid on jar and secure with a collar until finger tightened. Place in canning pot and boil for 10 minutes until bubbles form and begin to rise off the peppers. Remove from water and let rest for an hour. Any jars that have not sealed should be placed into the fridge. Use when desired but best after 4 weeks. Here is our favourite pickle recipe that we use for green beans, hot peppers, pickles, anything.... Thanks to Chris' cousin Ross and Danielle for the old family recipe that turns out great every time with nice crisp tart pickles. Prepare the pickling brine. Bring one cup of water, one cup of vinegar, and 2 tbsp of salt to a boil (1 Tbsp per total cup of liquid). Multiply this ratio as required to have enough brine for your jars. Better to make too much than too little. Place a half garlic clove, 8 peppercorns, and dill (if desired) in the bottom of a canning jar. Pack tight with green beans. Fill to a half inch with hot brine. Place lid and collar on the jar and finger tighten. Place in canning pot and let can of 10-12 minutes until bubbles just start to form and rise on beans. Remove from water and let cool. Discard any jars that don't seal or place in fridge to use immediately. Let them sit for at least 4 weeks to let them pickle and mellow a little bit.